The Winter Leagues concluded on a perfect if cold night in Stromness on Thursday. With East United having clinched the S3/S4 Winter League the previous week the main focus was on the S1/S2 League where Stromness and Thorfinn A faced each other in a winner takes all match. Thorfinn who were one player short battled well and led the match at half time having scored the only goal of the half. Stromness picked up and dominated the second period scoring two goals without reply to edge out the Kirkwall side 2-1. Having gone through the league unbeaten Stromness deserved their victory with the side continuing the success of the Predators side who won the primary indoor league 2 years ago. East United completed the S3/S4 league with a further two victories and they too went through the season unbeaten. In retaining the league for a second year in convincing fashion they scored 48 goals and conceded none finishing 10 points ahead of their nearest challengers Rovers. At the end of the matches Stephen Crawford OYDG Chairman congratulated all the teams and coaches who had put up with some difficult weather conditions and a spate of weather related cancellations over the winter months. The night concluded with the presentation of the silverware with Norris and Doris Chalmers presenting the N&D Chalmers Cup to Stromness and Jim Cormack presenting his cup to East United. OYDG would like to thank both sponsors and the clubs for refereeing the matches. Thorfinn A 1 Stromness 2; Thorfinn C 0 East Utd 5; Thorfinn B 0 Dounby 0; Thorfinn C 0 Stromness 4; Dounby 0 Thorfinn A 1; Thorfinn B 0 East Utd 2. East Utd A 1 Thorfinn A 0; Rovers 4 Thorfinn B 0; Stromness 0 Dounby B 0; Dounby A 0 East Utd A 2; East Utd B scratched v Thorfinn A; Stromness 1 Thorfinn B 2; Dounby B 0 Rovers 8; East Utd B scratched v East Utd A; Dounby A 0 Thorfinn A 0. East Utd 0 Thorfinn A 2; Thorfinn B 0 Stromness 1; Thorfinn C 0 Dounby 3; Stromness 2 Thorfinn A 0; East Utd 7 Thorfinn C 0; Dounby 0 Thorfinn B 2. 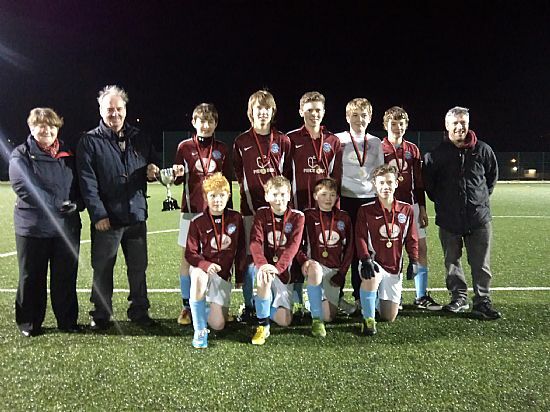 Week 4 of the S3/4 Winter League, for the Jim Cormack Trophy, finally took place last Friday at Stromness Academy, following two weather postponements. East United started the night with a comfortable lead in the competition but, following comfortable wins against Stromness and Dounby B, their perfect record was halted when they were held to a scoreless draw by Thorfinn A. The other teams in the top half of the league also performed well with Rovers taking three wins out of three and Dounby A two wins from their three matches. After several weeks of weather disruption last Friday night turned out a perfect night for football as the Winter Leagues got underway again. East Utd A have emerged as the favourites for the S3/S4 League as they retain a perfect 100% record after 6 matches. In the S1/S2 League Thorfinn A enjoy a narrow lead, as fellow challengers Stromness dropped points in an exciting 1-1 draw with East United. With both leading teams still to play each other an exciting finish to the season is looking likely. Thorfinn A 4 Thorfinn B 0; Stromness 4 Dounby 0; Thorfinn C 0 Thorfinn A 2; East Utd 1 Stromness 1; Thorfinn B 4 Thorfinn C 0; East Utd 0 Dounby 0. 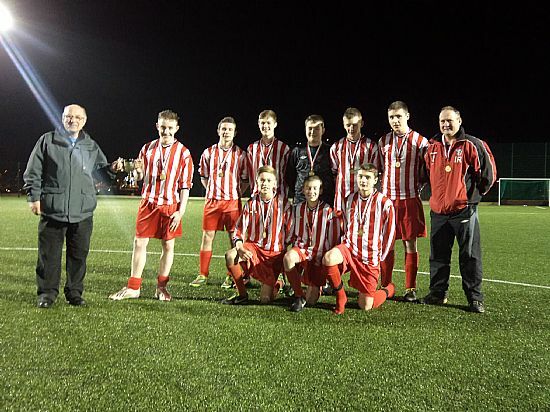 The 7-a-side Winter Leagues also re-commenced on Friday after the Xmas break at the Stromness All Weather Pitch. A cold swirling wind made conditions uncomfortable for spectators, coaches and referees but did not seem to deter the players who played some excellent football in the challenging environment. With two weeks of fixtures now played both leagues are starting to take shape. In the S3/S4 league, East United have won all of their opening matches to set the pace ahead of Dounby A and Thorfinn A. In Friday’s match against Dounby A although they had the majority of possession United had to rely on a lucky goal after a defensive slip up by Dounby for victory. In the S1/S2 league Stromness enjoyed a couple of convincing victories and share top spot with Thorfinn A who dropped their first points when they were held to a goalless draw by Dounby. East Utd B 0 Dounby A 4; Thorfinn B 1 Rovers 2; Dounby B 1 Stromness 1; East Utd A 1 Dounby A 0; Thorfinn A 4 East Utd B 0; Thorfinn B 0 Stromness 0; Rovers 3 Dounby B 1; East Utd A 7 East Utd B 0; Thorfinn A 0 Dounby A 0. Thorfinn A 2 East Utd 0; Stromness 5 Thorfinn B 0; Dounby 2 Thorfinn C 0; Thorfinn B 0 East Utd 0; Dounby 0 Thorfinn A 0; Thorfinn C 0 Stromness 11. This year’s Winter Leagues kicked off in difficult conditions in Stromness on Friday night. This is the second year of the N&D Chalmers Cup for S1 & S2 pupils and the Jim Cormack Cup for S3 & S4s and following the success of last year’s competitions the number of entries has increased significantly. The evening started with last year’s Jim Cormack Cup winners, East Utd taking on Rovers on one pitch while Thorfinn A played Thorfinn B on the other. Despite a strong cross wind, all of the teams adapted to the conditions well and played some fine football. By the end of the night, only East Utd managed to gain two wins from two games, however three further teams, Thorfinn A, Stromness and Dounby A remain undefeated, each recording one win and one draw. This is Dounby’s first year playing in the Winter League and it looks from these early indications that they will be among the teams battling for what is already shaping to be a very closely fought league. The N&D Chalmers Cup looks no less competitive with Thorfinn A establishing a slight lead at the top having beaten Thorfinn B and Thorfinn C on the first night. Close behind are Stromness and East Utd, both of whom recorded a win before fighting out a very evenly contested draw with each other in the final match of the night. Week 2 of this 6 week competition is scheduled for Friday 6th December at the Stromness 3G pitch, before moving through to the Kirkwall pitch for subsequent weeks after Christmas. Thorfinn B 0 Thorfinn A 4; Dounby 0 Stromness 2; Thorfinn C 0 Thorfinn A 6; Stromness 0 East United 0; Thorfinn C 1 Thorfinn B 4; Dounby 0 East United 1. East Utd A 2 Rovers 0; Thorfinn A 4 Thorfinn B 2; East Utd B 0 Stromness 1; Dounby A 7 Dounby B 0; East Utd A 3 Thorfinn B 0; Thorfinn A 0 Rovers 0; 20.30 East Utd B 0 Dounby B 2; Dounby A 0 Stromness 0.